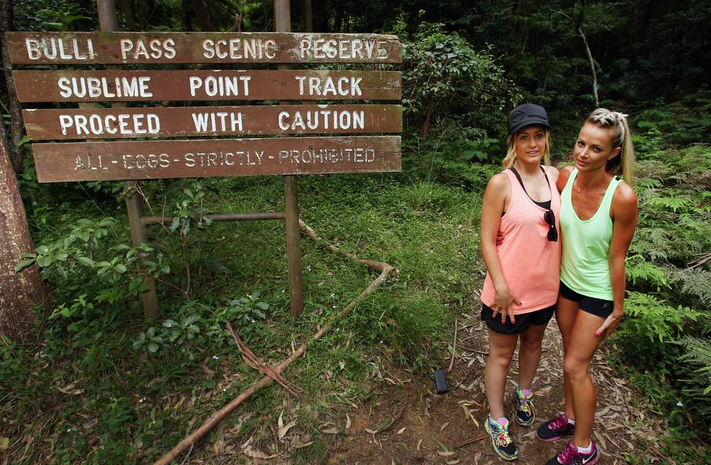 Woonona mother-of-three Candice Morgan has ditched plans to improve her fitness on the Sublime Point track, after a terrifying encounter with a large and mysterious animal. Candice, 29, was running up the track with her sister Stephy Morgan, 25, on Wednesday around dusk, when the pair were startled by a jet black animal with yellow eyes and a long sweeping tail. The pair’s frightening encounter is the latest of many sightings of the Illawarra’s much-discussed black panther – a creature believed to roam in dense bushland around the region’s northern suburbs. The experience has left the sisters shaken, with Candice vowing never to use the track again for steep uphill running. The drama unfolded when the women were about 100 metres along the track and an animal rushed out of the bush. ‘‘There is no comparison between a large domestic cat and what I saw on Wednesday night,’’ Stephy said. ‘‘I’m still in shock. The tail was the length of its long body, it was so distinctive, and it had these big yellow eyes. ‘‘It was much bigger than Candice’s two big adult Alaskan malamutes. ‘‘It was about 25 to 30 metres away from me and, taking its size and shape into account, you couldn’t think it was anything other than a panther. Candice did not see the animal but she felt and heard an unusual presence during the ascent. ‘‘I was in front of Stephy but I had my head down,’’ Candice said. ‘‘I was focusing on getting up because it’s a really hard track to run. It was really bizarre because as we were going up, I heard this weird rustling noise coming from the bush. ‘‘It wasn’t like a lizard or a possum. It sounded like something big. ‘‘At the same time as I heard the noise, I also felt that something was there. ‘‘All this happened in a split second but it felt like forever to me. When they got to the bottom of the track, the sisters took stock of what had happened. ‘‘Stephy was as white as a ghost,’’ Candice said. ‘‘She was sweating. She was beside herself and so was I, even though I didn’t see the animal.